January isn't supposed to be rainy and gloomy here in Sunny South Florida, but lately it has been. Rack was sitting at the backdoor. I had sent him out back so I could finish making breakfast. He usually sits out closer to the pool in his assigned spot next to the steps into the water, but this time he was closer to the house and under the roof of the Lanai. It was raining, hard. A McNab being a herding dog, Rack is usually pretty bulletproof with weather. As long as it isn't a thunderstorm, Rack won't mind a little rain. This was a cloud burst. We were having little green blobs on the radar come over us from The Bahamas. I let Rack in the house, and thought nothing of it, returning to putter in the kitchen. You can spend a lot of time puttering in the kitchen, trust me. I had run out of things to do at that point and I had a few other things that I needed to get done. Padding into the living room after the moist canine, I grabbed the laptop and the Cheeseburger In Paradise booster pillow that I use to raise it off my lap when I sat down. There was a rainbow striped across the sky. Time to get the camera and pretend to be a photographer again. 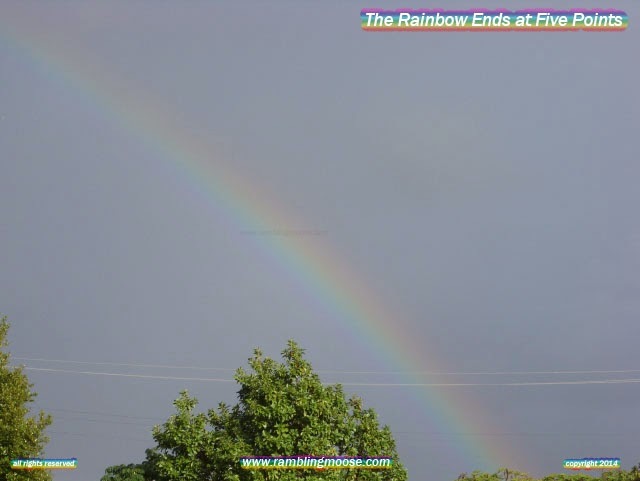 In Wilton Manors, a Redundant Rainbow was over Wilton Drive. It ended, at least by my view, at Five Points. Might have made for a good commercial, if I was so inclined. A Redundant Rainbow ends at a pot of gold in the lottery machine in the Publix. Nah, that's just cheesy commercialism, but the Simile was a little too obvious for me not to take note of. After all, it certainly wouldn't be the first time there was a rainbow over Wilton Drive, and it won't be the last.